My name is Biggles. For the past 12 years I have been running my own company, Shoot Locations, in Stockholm, which provides locations for advertising and fashion photography/filmproductions. I have rented out and been the location manager in many private homes for Ikea, H&M, Volvo, Nokia, TeliaSonera, Acne, Vouge, Elle Magazine to mention just a few. Providing a high-level service and making the people on the team feel comfortable is my business. Before Shoot Locations I ran my own fashion and interior design boutique, Harry´s Hardware, in Stockholm for 10 years. Thus, my experience of customer service is considerable. On a personal note I love beeing near the sea and the archipelago. I feel my best when I go to the red granite rocks outside the Northen Swedish High Coast or when I am out on a boat in the Stockholm waters. My name is Christian (or ”Krippa” to my friends) and married to Biggles. I have worked in the design industry for almost 35 years. I have had my own interior design shops ’Klara’ and a furniture production company ’CBI’. I have also taught at the University College of Arts and Crafts, Konstfack, in Stockholm. I am outgoing, and an aesthetically interested guy who loves both to cook and eat good food , drink bubbles and laugh together with old and new friends. I have travelled the world and seen fantastic places but still my heart pounds a little extra when I’m in Italy. But best of all is of course Stockholm. Considering our business backgrounds and that we both very much enjoy travelling to other countries, meeting different cultures and the ”locals”, it feels like a natural step for both of us to start StockholmCityRental. 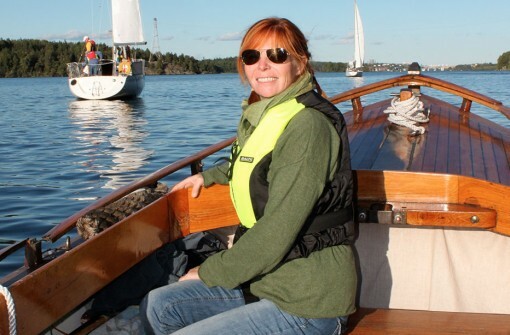 At home in Stockholm our best time is spent together with good friends, good food and drink, discussing everything or taking our old wooden boat, Cognac from 1932, for a spin under the bridges of Stockholm, picnicking together with our children and friends.